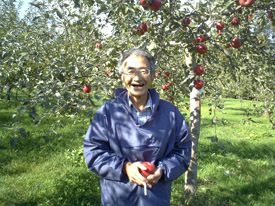 This book called “Miracle Apples” traces the remarkable journey of Akinori Kimura, a Japanese farmer who succeeded in growing apples without pesticides. His apples are so pure that a sliced apple doesn’t turn brown even after 2 years. They just shrink in size. Today, his harvests are booked several years in advance but 25 years ago, his life was nothing but a struggle. And this struggle seems to have created a saint-farmer out of him much like Fukuoka. I started reading this online book (24 small chapters) at 10 pm one night and just couldn’t stop. There are many goose bump moments and many teary moments and there remains the question of why he needed to struggle so much in those days for for knowledge that is so obvious today. But the greatest thing about the story is that at each and every critical juncture, he chooses the right path. No backups, no confusions. I can only salute this guy’s spirit. Highly recommended for reading.